USB is an acronym for Universal Serial Bus and is the technology that enables the connections between computer and external devices over a cable using bi serial transmission. It has 4 connections to it i.e. Vcc, Gnd, Data + and Data -. The devices can be connected to the computer without turning OFF the personal computer. It is able to support data speed from 12Mbps (USB1.0, USB1.1) up to 480Mbps(USB2.0). This type of connection is fast replacing RS232 and parallel port in many PCs. As it is now, many laptops no longer has any provision for RS232 connections. Peripheral devices that are designed to USB complaint are increasing every day. Some of them that are commonly seen by consumers are keyboard, mouse, modem, joystick, digital camera, microphone, scanners, printers, storage devices, web camera and telephones. USB was implemented in all personal computers since 1997. Windows 98 was the first Windows that has built in drivers to support its implementation. One big advantage of the USB is its capability to be connected up to 127 devices to a computer. USB can have 2 types of connections. They are type A (rectangular) and type B (square). Type A is usually connected to the PC and type B to peripheral devices. Expansion of the USB is done by using a USB port hub. In a typical design, if a device is using less than 500mA/5V supply, it is usually better to tap the power from the computer. The type of data transfer between the computer and the devices are interrupt (e.g. mouse), bulk (e.g. printer) or isochronous (e.g. speakers). USB2.0 version standard was released on April 2000 and is an upgrade version of USB1.1. It has better bandwidth and data transmission speed up to 480 Mbps compared to USB1.1 which has only 12 Mbps. This makes it an ideal applications for multimedia and storage devices. It is backward compatible to USB1.0/USB1.1 as it supports 1.5Mbps, 12Mbps and 480Mbps. You can get the USB2.0 reference project from Freescale Semiconductor that describes in detailed the design of a USB2.0 Card Reader. It support cards such as Compactflash, Memory Stick, Memory Stick Duo, Magic Gate, Secure Digital, MultimediaCard and SmartMedia. The schematic and source code of the reference projects are provided. 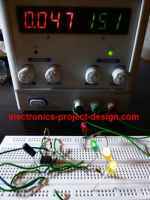 project is a good reference for students who need to do an electronics project in their final year of studies.